Three days, hundreds of students, countless events. Where should you even begin? The Argus has compiled a brief list of select events and programs to attend during your WesFest stay so you can make the best—and most fun—use of your time. The entire schedule is extensive, and these are just suggestions to get you started! You can find the rest online at wesleyan.edu/admission/admit/wesfest. Take some time to take care of your body, and let WesBAM guide you. Student instructors lead yoga, kickboxing, meditation, and other exercise classes year-round for people of all levels of experience. Pick a class for whichever form, style, and intensity you want, and drop in anytime throughout WesFest! Leave your parents at home for this one. Take some time and chat with real Wesleyan students, unfiltered and casual, about academics, student life, sports, arts, and anything else you want to know about from the perspective of the people who know it best. Don’t worry if you miss it one day—it’s offered all throughout WesFest. Thinking of studying abroad? Many Wesleyan students do! Join Gail Winter, Assistant Director of the Office of International Studies, and current students to talk about the different options and experiences for taking a semester or a year studying in a foreign country. Wesleyan’s annual Asian/Asian-American culture show is an explosion of dance, music, and vibrant colors. Don’t miss this showcase of Asian and Asian-American culture, featuring dance performances, spoken word, and an incredible amount of energy. There’s nothing desperate about coming to this improv show, which is sure to have you in stitches. Take a seat in the Nics lounge and prepare to laugh your head off. Be sure to attend this performance-packed event, brought to you by Wesleyan’s men of color collective. The night will make you think as well as entertain and the group plans to engage the audience in thought-provoking questions about community and race. Sparks will fly at Wesleyan’s student-run fire arts group’s annual performance. Let these talented spinners ignite the depths of your soul. Every year, the students from the Department of Classical Studies team up for a public, in-costume, in-character reading of Homer’s “Odyssey,” from start to finish. Just like Odysseus after the Trojan War, they’ll be traveling around campus for their epic performance. Poetry is fierce. WeSlam is fiercer. Come see and hear veteran poets and members of the WeSlam team present their favorite works in a relaxed, un-competitive setting. 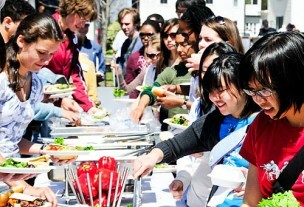 Join Wesleyan students and Middletown community members for an interfaith anti-oppression dinner. Celebrate Passover, Good Friday, or just good food with good people. No instruments, lots of vocal talent. Make your way to the lobby of Exley Science Center to hear all of Wesleyan’s immensely skilled a cappella groups perform in one big concert. It’s always WesFest’s most popular event, so show up early and get a good seat! Come for the name, stay for a hilarious and provocative performance. Wesleyan’s student-run theater company puts up a comedy about the complexities of defining one’s sexual identity. Watch Wesleyan students strut their stuff at the annual Student of Color Fashion Show. Pick up a ticket at the box office of the Usdan University Center and prepare to be dazzled by designers and models alike. Just how many groups and activities are there at Wesleyan? Too many to count. How many will you want to join? All of them. Outside of Usdan University Center, browse and talk to all of the student groups, clubs, and collectives: arts, sports, publications, politics, nationalities, and more. Arguably one of the best moments of WesFest, the all-campus BBQ is a chance to sit with all your new student friends and other admitted students on beautiful Foss Hill, eat some good food, listen to a killer lineup of student bands, look across campus, and realize why you’re coming here in September. From mathematics to neuroscience, from chemistry to psychology, student research abounds in Wesleyan’s natural sciences and mathematics division. Over 150 students do research through these programs every year, and this showcase exhibits their projects.